Biking in January? Yes you can! 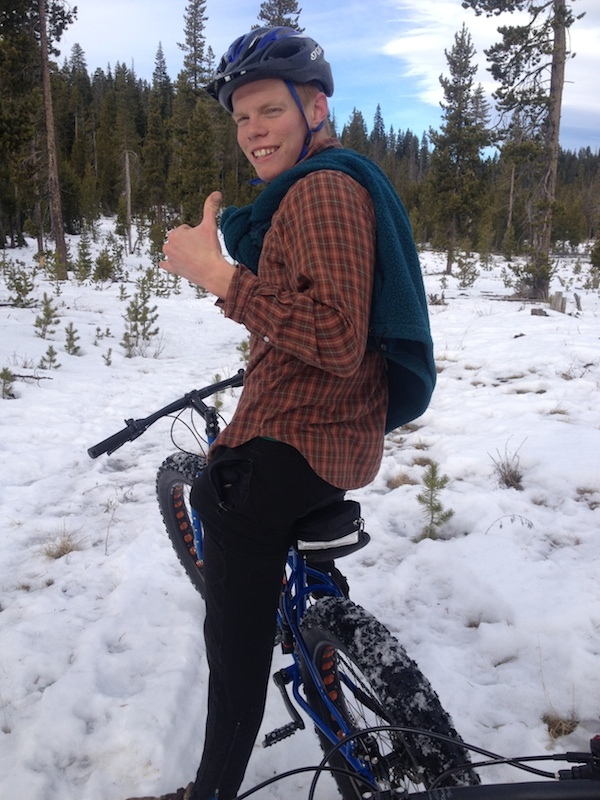 One happy Bend-ite trying out a fat bike. Usually, this is the time of year when the bikes are stored away and the skis are fairly broken-in. The thing is, winter in the Northwest hasn’t exactly been behaving like winter this year. And as far as snow goes we’ve got nothing. Zip. Nada. The average high in Bend over the holidays was 51 degrees, and precipitation levels have been historically low. So what’s a Bend-ite to do? Continue biking, of course! For mountain bikers and road cycling enthusiasts, this wacky weather has turned into an unexpectedly long riding season. For mountain bikers, trails such as Horse Butte, Horse Ridge, and the Maston network between Tumalo and Redmond are often rideable this time of year. But the Phil’s Trail complex on the West side and the River Trail network right next to PointsWest have been unusually great lately with only a few muddy patches to watch out for. Road bikers have also been able to keep pushing their pedals. Less snow, ice, and cinders means great riding all around town. Many riders are even venturing up Century Drive toward Mt. Bachelor. But that’s likely to end with snow coming back to the high country. When there is snow, fat tire bikes are just the ticket. Their four-inch wide wheels are great for snowy and icy terrain. People have been taking them up to the snow-deprived sno-parks and riding them on the cross-country trails. I’ve tried it myself, and I can tell you that you can’t have anything but a smile on your face when you’re on a fat bike. Chances are, winter isn’t done with us yet. But whatever weather comes to our neck of the woods, there’s always some way to get out and take advantage of it!